Days after the attack on Abnegation, Jeanine (Kate Winslet) has enacted Martial Law, for the safety of the remaining factions. She has cast the surviving Dauntless faction as enemies of the city. Tris (Shailene Woodley), Four (Theo James), Caleb (Ansel Elgort), and Peter (Miles Teller) have taken refuge with the Amity faction. Their plan is to locate the rest of Dauntless and attack the Erudite faction, removing them from power, and kill Jeanine. Jeanine, meanwhile, has found an artifact from the founders that will allow her to finally be rid of the Divergents. To access the artifact, Jeanine sends the Erudite forces, led by Eric (Jai Courtney) and Max (Mekhi Phifer) to capture all the Divergents. Tris and Four must find a way to reunite Dauntless and get to Jeanine before all is lost. But first, they must survive. 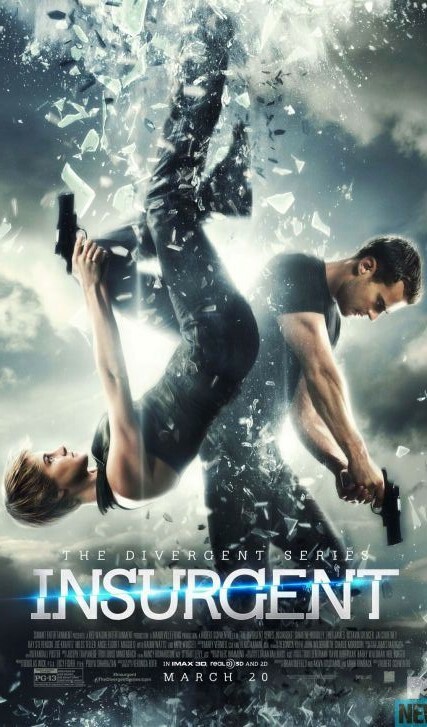 Insurgent picks up 5 days after Divergent ends. (It might not be a bad idea to catch up on the story by watching the original before watching the latest installment.) In this movie, the story focuses on the ramifications of the actions in the previous film. Also, allegiances are tested. Those who you may think are on your side may not be. And your enemies may just be your strongest ally. Shailene Woodley’s Tris is haunted by the events just days before, including the deaths of her parents. As you can imagine, Tris is tortured by the memories. Shailene does an excellent job of portraying this, even if this means she is crying in almost every scene. She does have enough composure to be a badass when needed. There is good chemistry between Shailene and Theo James. The love story between these two definitely plays up the Young Adult story the movie was adapted from. Miles Teller has a more significant role in Insurgent than he had in Divergent. This is a plus for the film, as we get more of his sarcastic wit. Not that Miles is just comic relief. He carries his character well. As you can expect, the cinematography is top-notch. The wasteland of the city and its surroundings is well presented. I was concerned at the beginning that the 3D was going to be overdone. Which it is, in the beginning. They effects crew gets over this pretty quickly, and it becomes more subtle. During the simulations at the end of the film, the 3D team finds their groove and kicks it up where it needs to. Over all, it is pretty effective. The story moves along at a quick pace. The intense action keeps things moving along nicely. There are a few scenes, most notably between Tris and Four, that seem to linger on a little long. This can be forgiven, as it is a part of the story most likely aimed at the teenage girls. Insurgent is definitely better than its predecessor. The second film does not need to take the time to set up the premise, so it can focus more on the action. The ending almost seems to wrap things up, so I’m curious what the next film will bring. Although, it is pretty easy to guess, even without reading the books, where things will go. Teenagers will undoubtedly enjoy the film. But it’s not focused so much on that audience that adults won’t be able to enjoy it, either. A good choice for a movie night with your older kids. to fit in with the individuals around you.